A fun and stripey shawl by Rosina Northcott that uses interlocking crochet on its edging to create an on-trend brioche effect. Get to work on this project with a copy of Inside Crochet issue 102. If you're not a subscriber, you can still pick yours up by ordering online, or by downloading an issue directly to your smart device. You can use any light DK weight Merino wool yarn to achieve a similar effect. 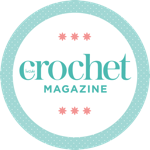 Rosina is a Devon based crochet designer. You can find her on Instagram as @zeensandroger and she frequently talks about how brilliant crochet is elsewhere online too! Her blog is zeensandroger.wordpress.com.